These days, we see more and more interior designers, architects and decorators directing their attention to outfitting one-room apartments. Commonly known as studio homes, these often tiny dwellings can be difficult to design, even for the most skilled professional. However, with space becoming increasingly expensive and scarce, it is universally acknowledged that individuals will need to reside in compact abodes. However, decorating and designing a one-room apartment doesn’t have to be an exercise in the impossible. In actual fact, with the right planning and vision, small homes can actually appear far larger than they are. If you’d like to see some great examples, and perhaps grab a few ideas for your own one-room property, check out the images below and start arranging your refurbishment today! 1. Small and simple, yet stunning! The living area of this home is surprisingly spacious given its one-room status. Boasting smart interior design, which maximises the division between the different living areas, this abode is sure to impress. Furniture is simple yet effective, adding comfort and class, while the ultra light peach tones bring a feeling of warmth, without sacrificing airiness. We love the hanging bookshelf, which helps delineate the front hallway from the sleeping area, adding storage, as well as style. 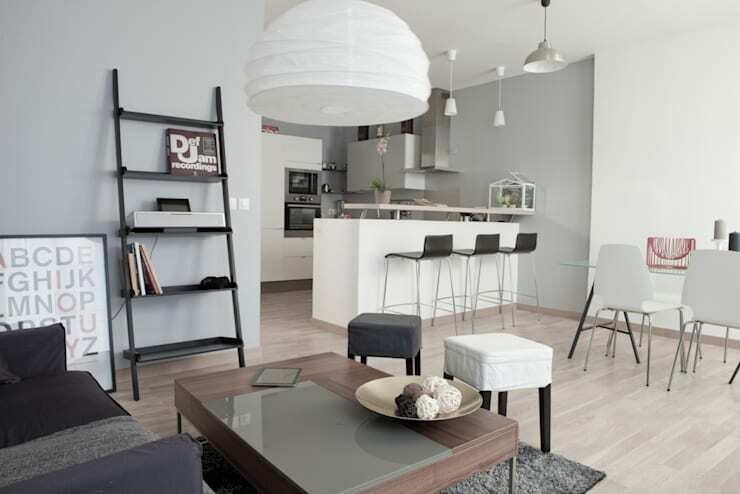 This one-room apartment is rich in elegant accessories, and a feeling of urban modernity. Making the most of the height within this space, the architects were able to split up the different living quarters, enhancing the home, and creating a much larger area for its occupants. The bright white colour scheme has been contrasted beautifully with dark timber laminate flooring, built-in furniture, and dark black railing. This adds to the overall feeling of chic contemporary sophistication, as well as ensuring visual interest. In this room the designers have worked with a few essentials to create a space that feels far larger than it is. 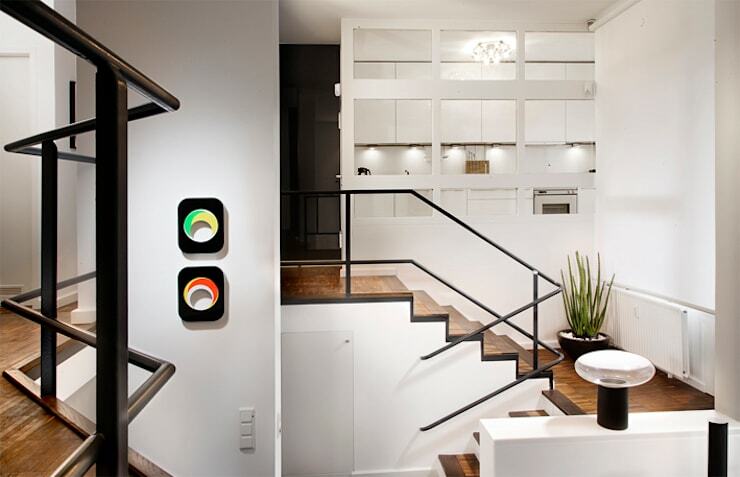 The colour scheme is one of the main tools, which has been utilised to evoke a sense of cool airiness. The ambience is welcoming, yet still chic and edgy. 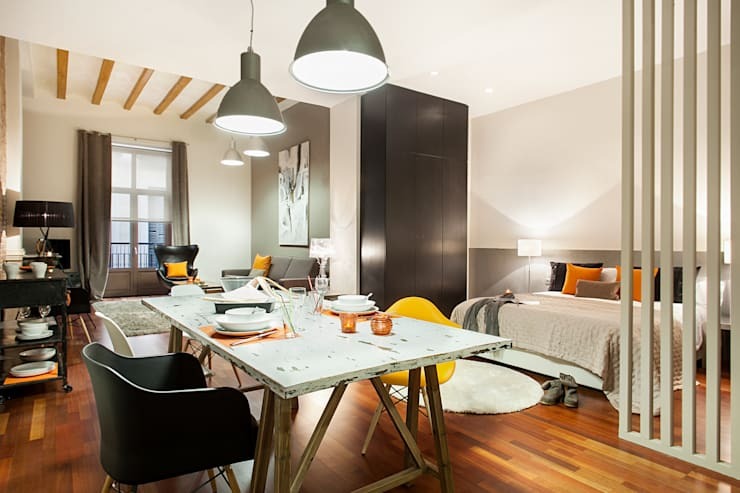 With a discernible French quality, this Paris apartment includes all of the essentials, in a comfortable and enticing package. 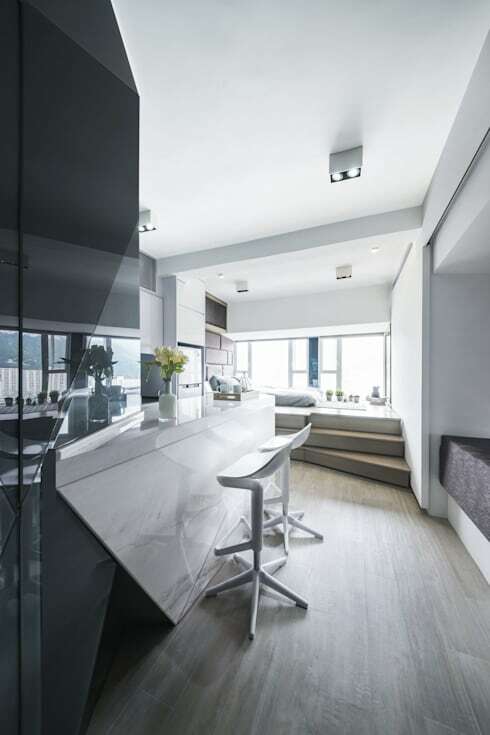 Heading back to our home town of Hong Kong, we take a tour inside a studio apartment that is seriously stylish! At only 25 square metres, this is a truly tiny home, but manages to feel much larger. With a black and white colour scheme, the architects removed many internal walls, which were prohibiting the residence's ease of movement. Created for a young couple and their puppy, this is certainly a minuscule dwelling, but still an extremely desirable one! On the larger side of the scale, this one-room abode is brimming with a range of gorgeous design components. The large bed is sectioned off from the rest of the house by the timber wall panelling, while a separate living area helps the room feel luxurious and welcoming. An ideal pied-à-terre, or first home for a couple, this high-ceiling residence feels hospitable, warm, cosy and wonderfully alluring. Last, but certainly not least, we take a peek within a much larger and luxurious one-room home. Minimalism has been employed in this apartment, which brings a feeling of spaciousness and comfort. The bedroom is divided from the rest of the living areas with glass partitions, while high ceilings help the room to feel opulent and majestic. Which one-room apartment is your favourite? Let us know below!